Almost all boats, whether directly cooled by seawater, or indirectly cooled by fresh water and a heat exchanger, have a seawater pump. In addition to cooling the engine the seawater cools the exhaust system, usually made from rubber and plastic materials that could not withstand direct exhaust gas temperatures. 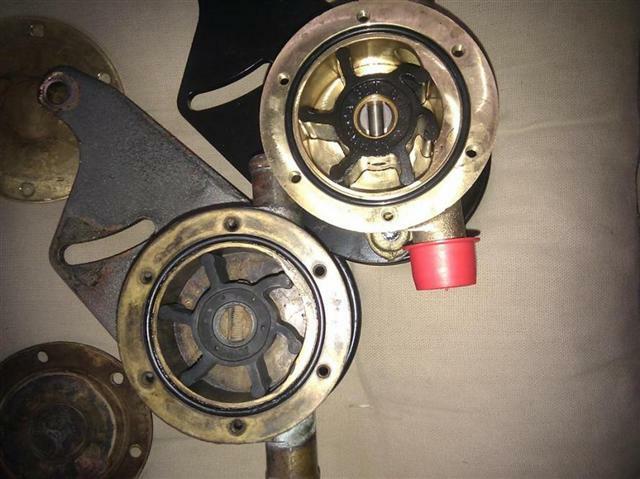 The type of pump used is a positive displacement type, whose body is commonly made from a copper alloy such as brass or bronze, with a rubber impeller. The pump is driven directly by the engine in some designs, or indirectly via a belt in others. Directly driven water pump on a Beta engine. 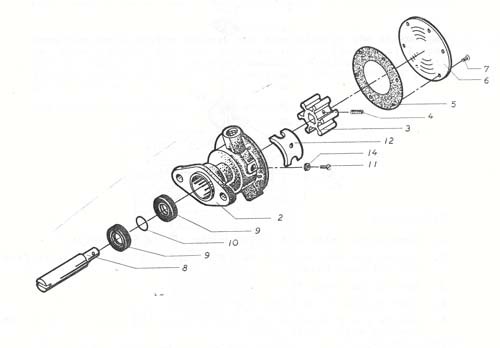 The location of the pump is excellent in this design, ideally placed for maintenance of the impeller. Directly driven water pump on a Bukh engine. Maintainability of this pump is again good but it has a particular disadvantage. 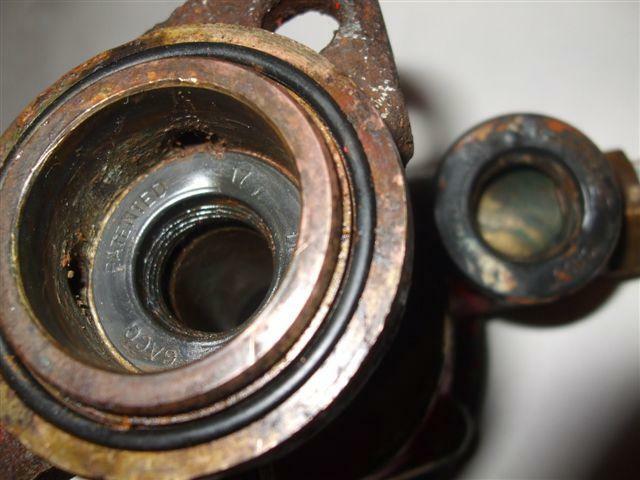 Failure of its shaft seals can divert seawater to the engine sump, possibly leading to serious and expensive problems. Indirectly driven water pump on a Yanmar 3GM30. The pump is driven by a belt running on the smaller of two pulleys on the crankshaft. The pump cannot be seen here as it is reversed, pointing aft. Maintainability is thus very poor. 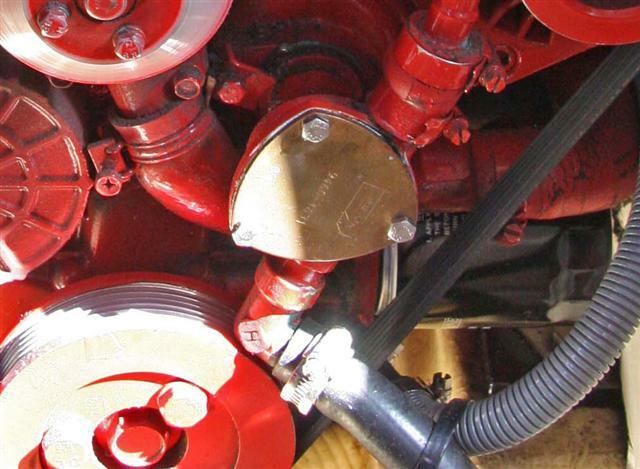 Removal of the face plate to remove the impeller can only be accomplished after unbolting the pump from the engine, although this can be done without disconnecting the hoses. 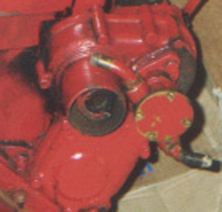 This inconvenient design has been rectified on the Yanmar YM series, in which the pump is mounted separately ahead of the pulley, in roughly the same position below and to the left of the engine. 6. Face plate. Wear of the plate can lead to priming problems. Reversal of the plate is sometimes possible. 7. Screws. Can be replaced by knurled nuts in the Speedseal design. 10. O-ring. Optional, sometimes an O-ring is used as a flinger, there may be a purpose made plastic flinger or in some kits no such part is included. 12. “New moon” plate or cam. 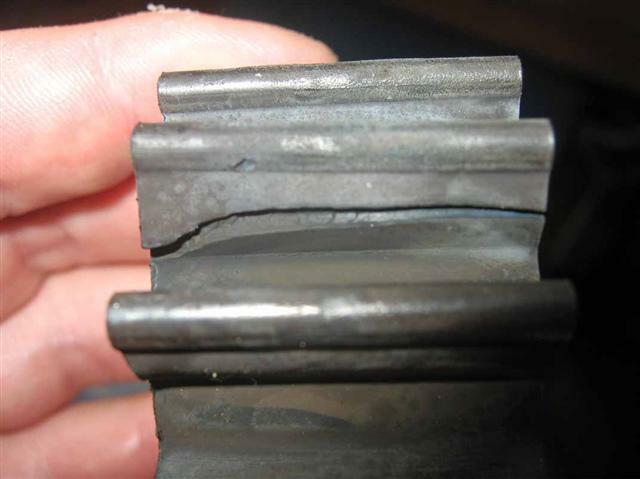 This causes deformation of the impeller blades, varying the cavity size. 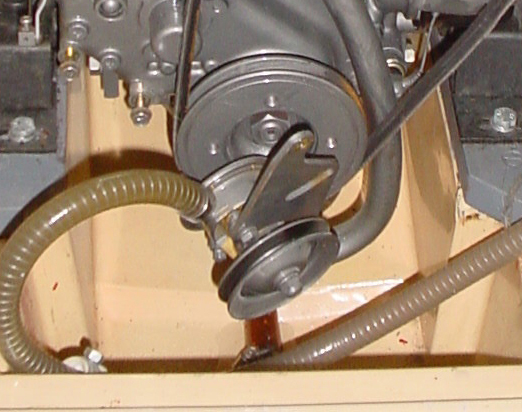 This photograph shows the water pump drive on the engine block of a Bukh 20. 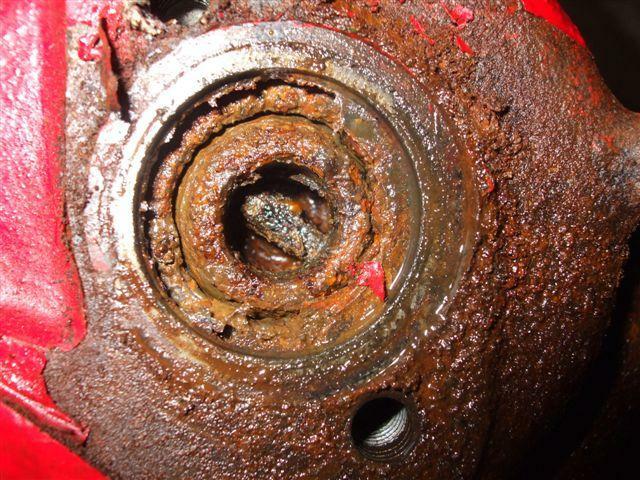 The wet and rusty condition of the shaft and drive pin show clearly that the shaft seals in the pump have failed, as has the O-ring between the pump and the block. 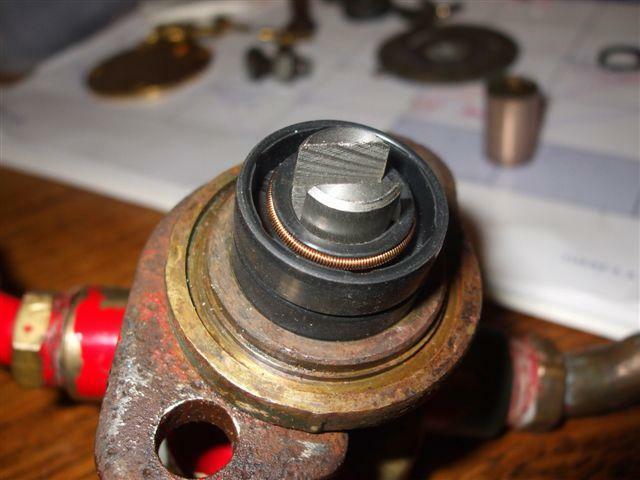 Seal failure at this level usually results in contamination of the crankcase oil with seawater. In this engine the pistons seized in their bores as a result of corrosion by the water. 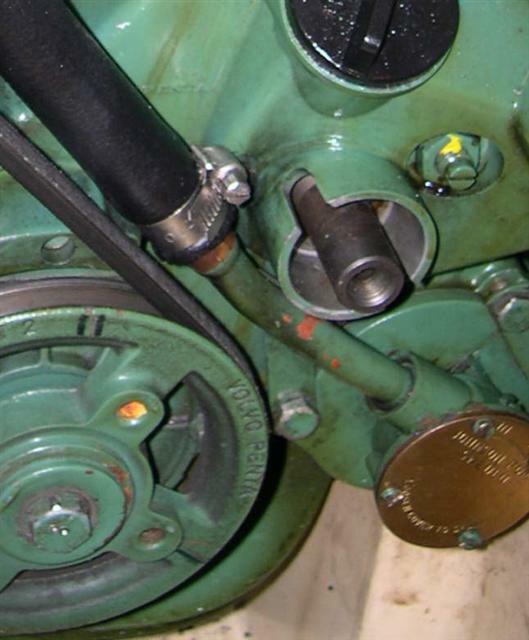 The tell-tale drain hole in many of the pumps fitted to Bukh and other engines is a small drilling, as opposed to some that have two large rectangular ports. It is worth adopting a regular procedure to clean the small drilling out with a wire, as it can become blocked with oil debris. 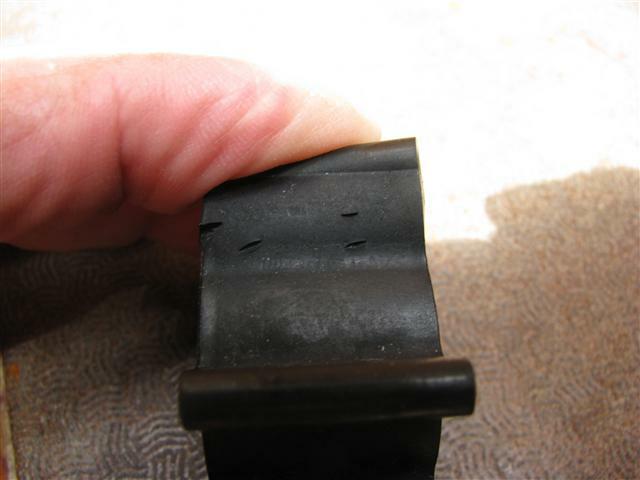 When this happens any seawater passing the water seal will pass through the oil seal easily. The pump that was connected to the block, above. The seal at centre appears to be damaged and has obviously been leaking water for some time, although the one visible is intended to keep oil out of the engine. A used shaft in the foreground, new behind. The seal lip will wear a shallow groove over time, especially in sandy or silty water. 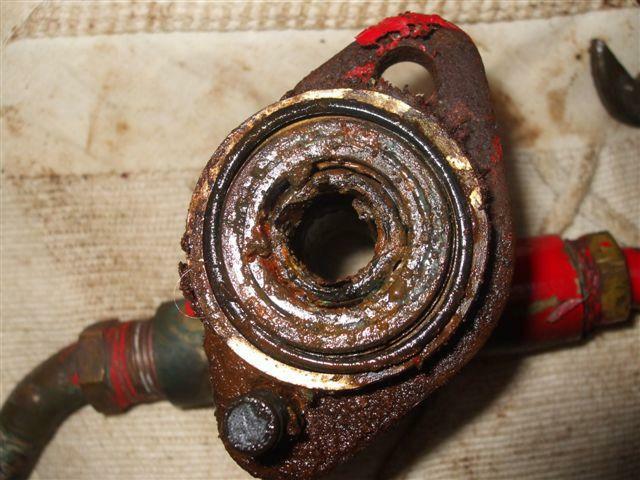 Repair kits for smaller pumps normally include a replacement shaft but larger ones may not. The pump body in the process of being rebuilt. The seals need to be driven in carefully and kept square, with the driving force applied close to the outside of the seal . A convenient way for doing this is to use a socket spanner that just fits in the bore of the housing. In the example shown the seal has been driven close to its bore, which has deformed the seal. Above the seal two holes can be seen. These are intended to vent any leakage from the housing in order that it does not reach the crankcase. Any signs of water leakage down the front of the engine should be investigated. The two seals on the new shaft, outside the pump body. The spring side normally faces the fluid. Thus the seals are assembled back-to-back, the lower one here facing the pump impeller. In some versions of the pump there is a spacer between the seals. This may also be a ‘flinger’, a cylindrical spacer with a few spikes on it. This is designed to throw any water that leaks through the water-side seal out of the pump body via the holes shown in the photograph above. Seals with stainless steel springs instead of the bronze ones shown here seem to last longer in seawater. Failure of the pump to prime is a frequent occurrence. The cause is most often wear of the front cover, easily rectified by resurfacing, replacement, or, in some cases, turning it over. Another cause is failure of the lip seal in the housing, which allows air into the pump. The photograph shows a third. 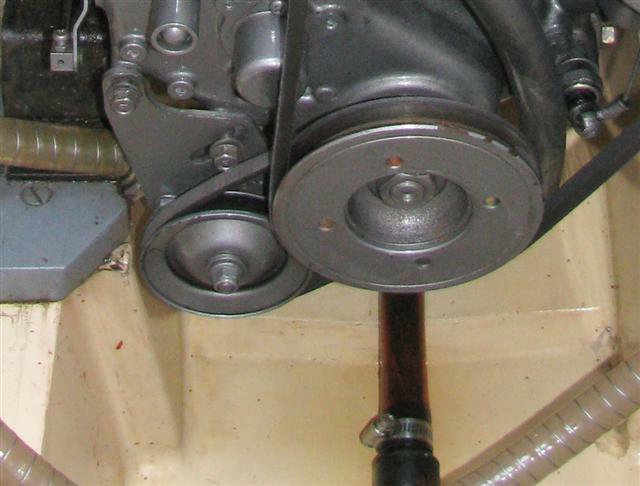 Over time, and dependent upon the area in which the boat has been used, sand and silt can cause considerable internal wear of the cam that deforms the impeller vanes. 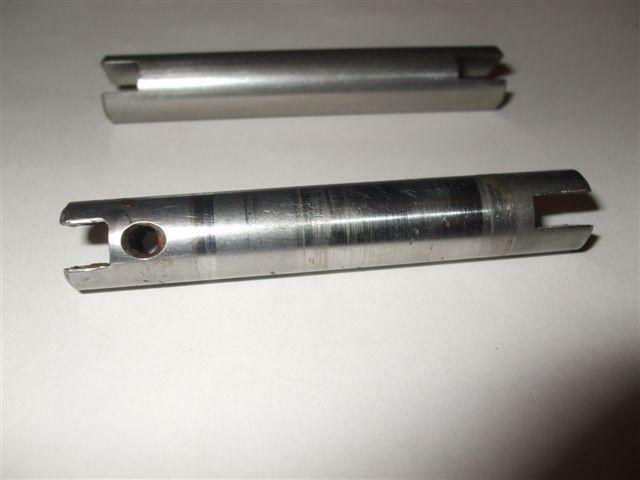 Old pump inner chamber diameter: 50.2 mm. Diameter to cam: 48.25 mm. New pump inner chamber diameter: 50.0 mm. Diameter to cam: 46.00 mm. Old pump flow rate ~180L/h at 1000 rpm. New pump flow rate ~420L/h at 1000 rpm. New pump flow rate ~630L/h at 2000 rpm. 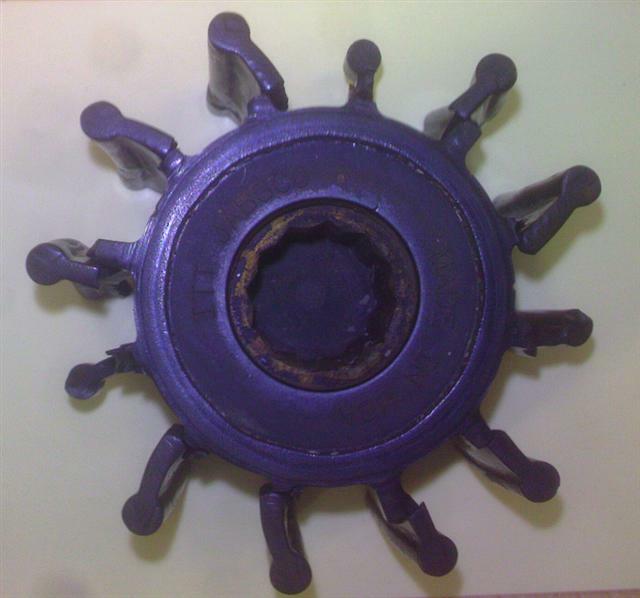 A typical impeller from the water pump of a small engine. All three makes shown above are very similar, although not interchangeable.The primary cause of impeller failure is probably dry running, due to arrest of water flow. 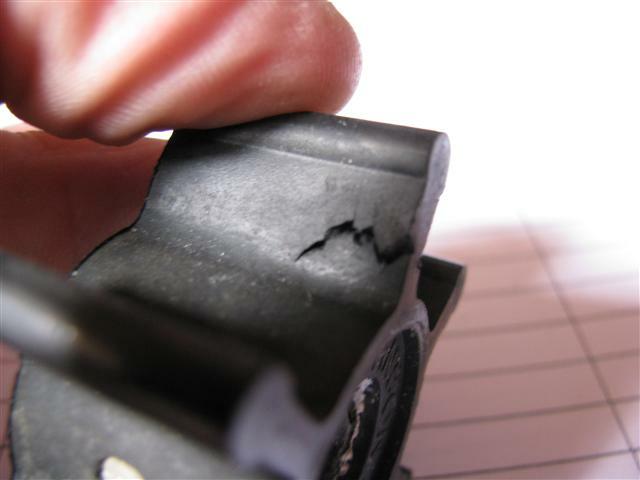 Common causes are blockage by debris, forgetting to open the seacock and air leaks preventing priming of the pump. A two year old impeller, in regular use but not many hours.The bond between the rubber and brass bush has failed. This failure mode is quite common but its cause is unclear. Seizure of the vanes due to temporary dry running is a possibility, although in this case the system was perfectly airtight and there was no sign of a blockage on investigation. The screw, used as a pin drive in many designs, is bent and the vanes were starting to crack. 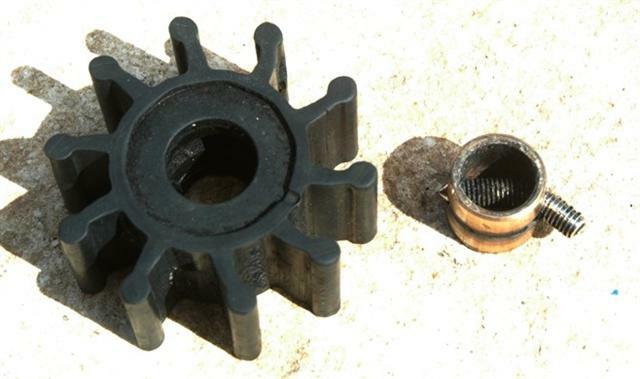 A failed impeller from one of two engines in a 1978 Broom Crown on its first service in present ownership. Engines are Perkins HT-6354. The impeller on the other engine was in perfect condition, but the outer plate on this pump was very worn. Worn face plates can often cause the pump not to prime, so that it runs dry for a time. This may well be the cause of the failure. Reversing the plate, possible with some designs, restores flatness on the impeller side. Since this was done the pump has performed faultlessly. An impeller inspected after 14 months and 150 hours. 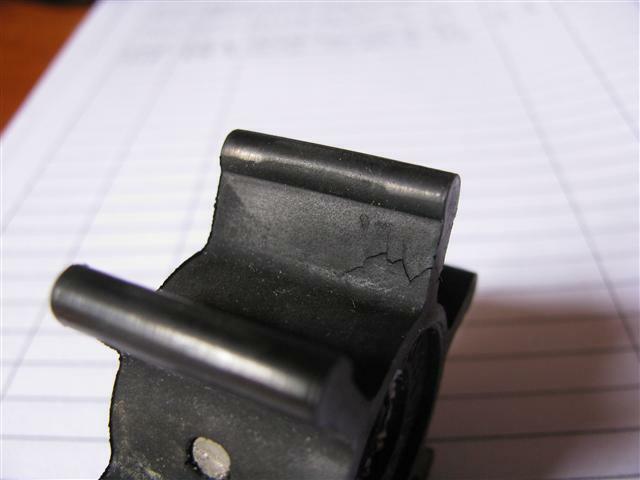 Quite close to losing a vane, which inevitably is problematic and can cause damage to an engine. When vanes break off they are transported downstream, where they can lodge in heat exchangers and cooling passages. All such fragments must be accounted for after an impeller failure and before restarting the engine. This pump was fitted to a Yanmar engine. Various pumps are used by Yanmar, usually Jabsco or Johnson. Impellers are usually interchangeable from either manufacturer but beware that various designs and sizes may be used for the same engine. This impeller was a Johnson one.